I have often seen normal laypeople who are testifying realize, on the stand, they have underestimated the emotional pressure that the formality of the courtroom imposes on them. There is something about the utter dignity and formality of the Courtroom, with the judge sitting high on the bench, with a court reporter taking down every word uttered, with 12 citizens sitting in judgment, with a Deputy Sheriff at the door, that brings the enormity of it all into crystallized focus. 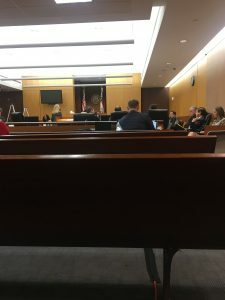 In this medical malpractice trial I was watching, there was a moment with one of the defendants on the witness stand when he simply broke down during his testimony. He began to tear up on the stand and the began to cry, and the plaintiff’s attorney quickly asked the judge for a break. But it was too late. The defendant began crying uncontrollably, and literally fell down on the floor from the weight of it all. His attorney had to go help get him off the floor and then out of the courtroom as the bailiff quickly took the jury back to the jury room. It was clear that the defendant had suffered something so strong emotionally that he could not go on. We were all worried about his mental well-being. I knew his attorney and knew he would make sure his client was supported emotionally and not left alone. I believe his attorney was sincerely concerned about his client’s ability now to go on with the trial and meaningfully participate in the trial and assist his attorney. In speaking with several of the attorneys in the case, both plaintiff and defense, not one of us had ever seen something like that happen in a trial before. Most of us had practiced for over 30 years. Meanwhile, the plaintiff’s attorney felt just as strongly that the defendant’s outburst of emotion directly in front of the jury was so overly prejudicial that the jury could not help but sympathize with the defendant, regardless of any instruction the judge might give to the contrary. Telling a jury they may have no sympathy for either side is easier said than done when a witness has just broken down in front of their eyes. Discussion was had by all counsel with the judge in the judge’s chambers, and I was not privy to what they discussed and argued. Eventually, the defendant who had broken down on the stand reappeared in the courtroom. He looked shaken and seemed to be trembling. He was visibly trembling as he took sips out of a water bottle. There was no question in my mind that this was sincere and beyond his control. I felt empathy for him. After about an hour, though, the judge and all counsel came back into the courtroom and the jury was brought back into the courtroom. The judge declared a mistrial and thanked the jury for their work and instructed the jury they were no longer needed and that their jury duty had been fulfilled.